^ Bruno Ganz, Who Played an Angel and Hitler, Is Dead at 77. 纽约时报. 2019-02-16 [2019-02-16]. ^ Bruno Ganz, who played Hitler in Downfall, dies aged 77. 英国广播公司. 2019-02-16 [2019-02-16]. 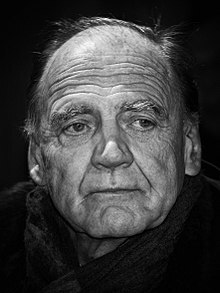 ^ Bruno Ganz Biography / Wim Wenders - The Official Site. web.archive.org. 2011-05-24 [2019-02-18]. ^ Rockwell, John. ARTS ABROAD; With Pivotal Actor Back, Marathon 'Faust' Gets Another Look. The New York Times. 2001-01-04 [2019-02-18]. ISSN 0362-4331 （美国英语）. ^ Rockwell, John. CLASSICAL MUSIC; After Karajan In Berlin, No Deluge Yet. The New York Times. 1993-10-24 [2019-02-18]. ISSN 0362-4331 （美国英语）. ^ Luigi Nono: Il canto sospeso; Gustav Mahler: Kindertotenlieder - Claudio Abbado | Release Credits. AllMusic. [2019-02-18] （美国英语）. ^ Gates, Anita. Bruno Ganz, Who Played an Angel and Hitler, Is Dead at 77. The New York Times. 2019-02-16 [2019-02-18]. ISSN 0362-4331 （美国英语）. ^ The Guardian. Wikipedia. 2019-02-17 （英语）. ^ Quinn, Ruth; Thorpe, Vanessa. Bruno Ganz, actor who played Hitler in Downfall, dies aged 77. The Guardian. 2019-02-16 [2019-02-18]. ISSN 0261-3077 （英国英语）. ^ Mackie, Rob. Downfall. The Guardian. 2005-09-16 [2019-02-18]. ISSN 0261-3077 （英国英语）. ^ 如何评价《帝国的毁灭》？ - 知乎. www.zhihu.com. [2019-02-18].